The food served there at Meimen 梅門養生餐廳 are quite simple but taste good, 不做作, comfortable for my body & stomach, very nice peaceful environment. It’s from our Taiwan Meimen trip (台灣梅門之旅)! 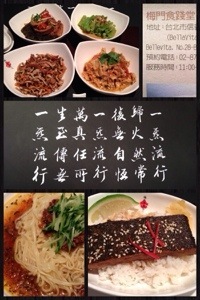 This entry was posted in Eat and tagged meimen vegan, 台灣梅門，梅門養生，meimen. Bookmark the permalink.